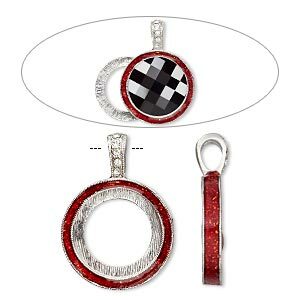 Pendant, Almost Instant Jewelry®, epoxy / Swarovski® crystals / imitation rhodium-finished "pewter" (zinc-based alloy), light Siam red and crystal clear with glitter, 33x24mm single-sided with 20mm round setting. Sold individually. Item Number: H20-A2927FN Have a question about this item? 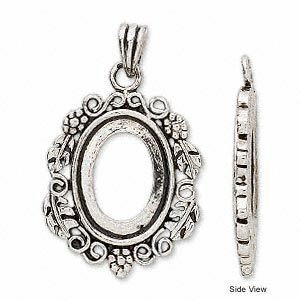 "Pewter" (zinc-based alloy) glue-in style pendant setting with separate backing for security. Pendant setting is specifically designed to fit a Swarovski® crystal 20mm flat back faceted chessboard round (2035) and will also fit a 20mm round cabochon. Setting is enhanced with colorful enamel and glitter as well as sparkling Swarovski® crystals on the bail. Pendant features a 4mm bail to accommodate chain, leather, satin, custom kumihimo cords or other stringing materials. 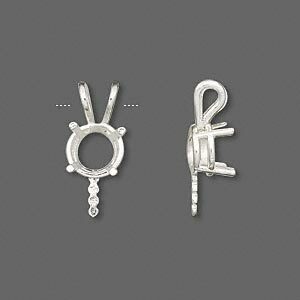 Pendant, JBB Findings, fine silver, 20x8.5mm 4-prong with 8mm round setting and 5.5mm peg. Sold individually. 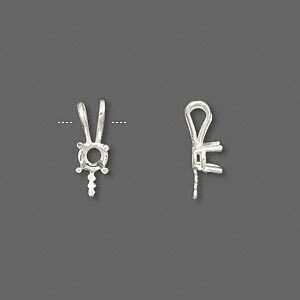 Pendant, JBB Findings, fine silver, 15x6mm 4-prong with 4mm round setting and 4.5mm peg. Sold individually. 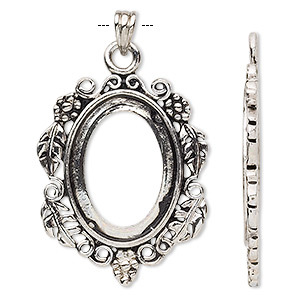 Pendant, antique silver-plated brass, 72x47mm oval with flowers and leaves with 40x30mm oval setting. Sold per pkg 2. 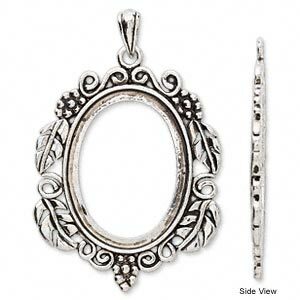 Pendant, antique silver-plated brass, 48x29mm with flowers and leaves with 25x18mm oval setting. Sold per pkg 2. Pendant, antique silver-plated brass, 36x23mm with flowers and leaves with 18x13mm oval setting. Sold per pkg 2. Pendant, antique gold-finished brass, 72x47mm with 40x30mm oval setting. Sold per pkg of 2. 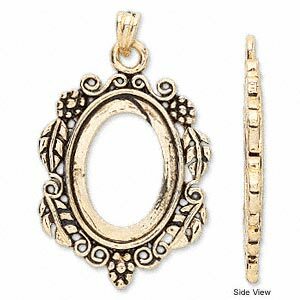 Pendant, antique gold-finished brass, 48x29mm oval with flowers and leaves with 25x18mm oval setting. Sold per pkg of 2.